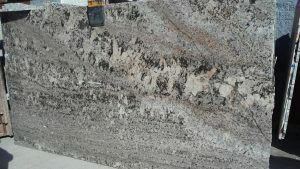 Bianco Antico is a Brazilian granite that is loaded with character. The overall appearance is not uniform and the large grey / brown mineral deposits that are scattered all over the stone are easily visible. 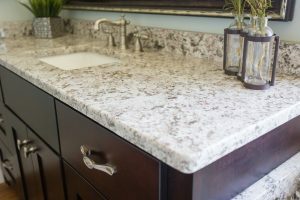 When you combine with dark cabinets, the contrast is very strong between the light granite and the cabinets. 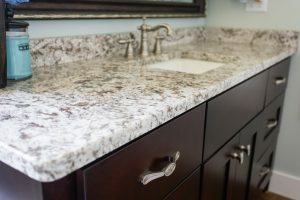 However, thanks to the stunning brown minerals throughout the entire stone, the countertops feel like they tie in with the room and do not look too stark. 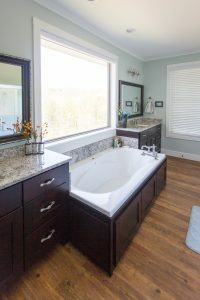 Here’s a great example – check out what it brings to the table in this stunning bathroom that we recently installed! This color and more in stock now! Call or stop by with your measurements for a free estimate!